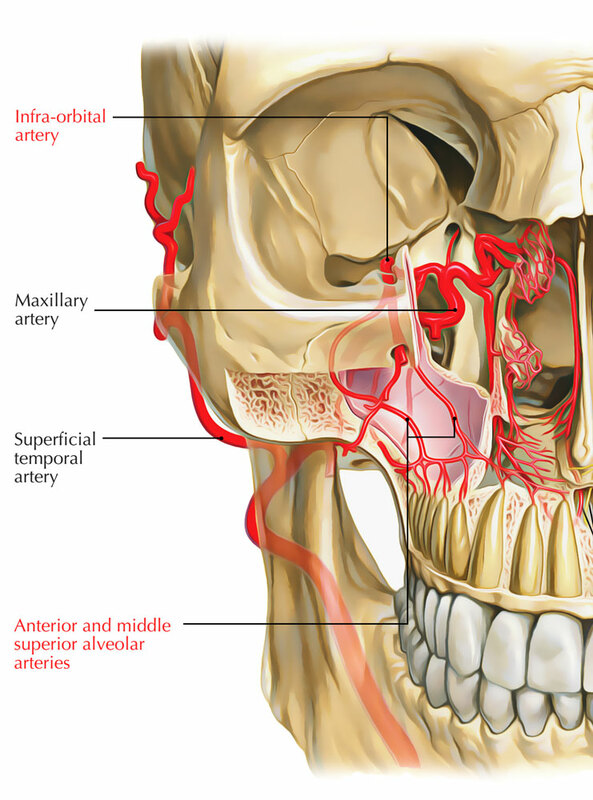 The infraorbital artery originates from the infraorbital foramen along with the infraorbital nerve and is a terminal branch of the maxillary artery. Along most of its course and on exiting the foramen, this small artery which has the diameter of approx. 1.0 mm accompanies the circulation of the nerve and circulates numerous muscles of facial expression. The normal cutaneous zone of the infraorbital artery is only 8 cm sq and lies 2 cm inferior towards the orbit and 4 cm lateral towards the alar cartilage of the nose. The infraorbital artery anastomoses with the facial, transverse facial and ophthalmic arteries. Towards the teeth of the upper jaw.